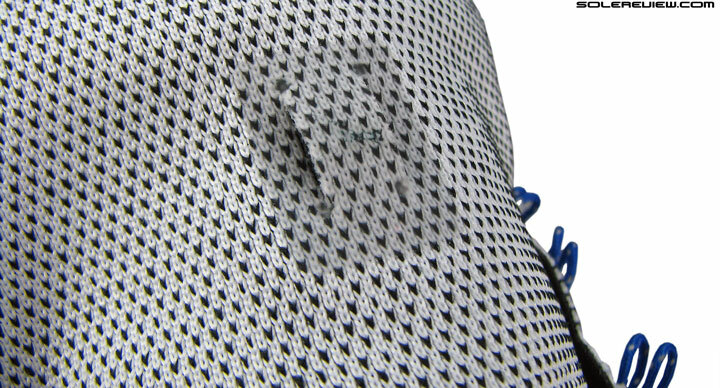 Upper: Single piece engineered mesh, partial inner sleeve design. Flywire cord based lacing support. 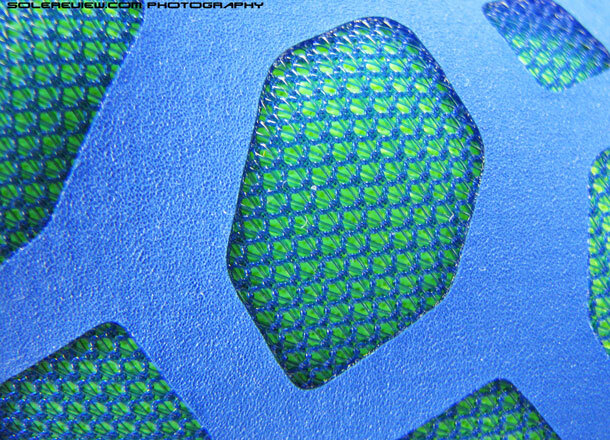 Midsole: Heel Zoom Air bag embedded within a firmer EVA casing. 10 mm heel to toe offset. Outsole: Carbon rubber with some recycled content. Widths available: Regular (reviewed), Wide, Extra wide. At a basic functional level, the Pegasus 32 is the same shoe as the 31, except for a tighter forefoot and midfoot. Weight sees a marginal reduction, and heel reflectivity is gone. If you’re on the fence, wondering if it is a better idea to get last year’s Pegasus 31 on markdown prices, rather than ‘upgrading’ to the newest version – which happens to be the Pegasus 32 – let us give you a gentle nudge to help tide over the classic dilemma. So what’s it going to be? The Pegasus 31, or 32? The short answer is: get the Pegasus 31 instead. To describe the Pegasus 32 better, we’ll invent a new term called ‘cruising update’. The 2014 Pegasus 31 was a remaking of Nike’s oldest running shoe franchise; the upper and midsole design underwent a complete overhaul . Hence the Pegasus 31 was based on a brand new template, quite different from the one which the Pegasus 29 and 30 were cut out of. Regardless of the directional shift, the Pegasus 31 was validated by positive feedback from runners. Most (including us) appreciated its slightly faster and focused feel, though it no longer remained the ‘comfort’ shoe which was the hallmark of the Pegasus 30’s character. Thus, for the better part of the past year, the Pegasus 31 cruised smoothly in its price segment and neutral running category. So what does one do with a shoe like that? The smart thing to do here would be to leave it unchanged in character, and apply a ‘cruising’ update. Which is exactly what the Pegasus 32 is. That said, this sentiment won’t apply if the Pegasus stays the same next year, in which case our review will be peppered with words such as ‘stale’ and ‘fatigue’. But spring 2016 is a year away, and the Pegasus 32 is well within the established boundaries of the two year platform lifecycle – a design update cadence which Nike follows, along with brands such as Saucony and adidas. Same midsole platform and silhouette, with some changes on the upper. The Pegasus 32 sticks to the basic tenets of the 2014 Pegasus, while applying a few updates within that framework. We’ll deep dive into the changes, but given their lower magnitude, it is far better value to get a pair of the Pegasus 31. We say that for a few reasons. If you bought the Pegasus 31 for its ride quality, then there’s hardly any deviation. There is a minute amount of tinkering in the identically designed midsole, but that barely amounts to be noticeable. The upper fit character has evolved on the Pegasus 32, yet whether that is a positive or negative will be purely personal depending on one’s shoe choices. We’ll play our part and get into the long and short of it, but for now, we’ll say that those updates are not significant in nature – after all, the Pegasus 32 is a ‘cruising update’. A noteworthy aspect of this discussion is the Pegasus 32’s revised retail pricing. There is a $10 bump over the 2014’s $100 sticker, and this for a shoe which is basically the same as last year’s version. Even on Nike’s own website, the Pegasus 31’s pricing is now in its high 70’s, and we’re sure better deals lurk around in other places. So this means that by buying a Pegasus 31, you save anywhere between $30~50, depending on how good a deal you get. That’s not exactly pocket change. If that’s all there is to it, what do you gain by staying and reading the full review? 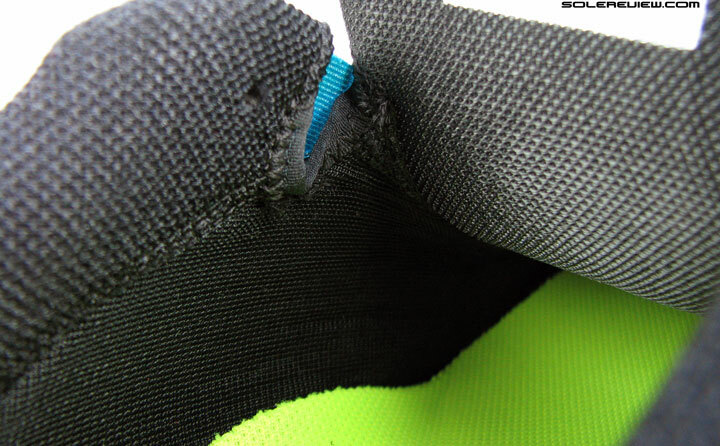 If you stay for the rest of the review, we’ll show you what an intact( and cross sectioned) Zoom Air bag looks like. For real. 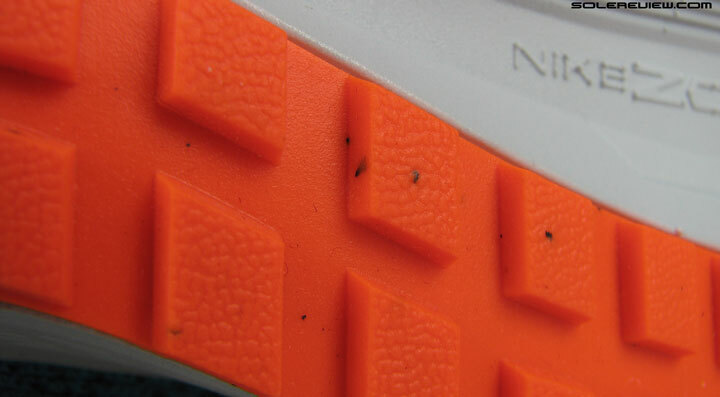 To begin with, we’ll go over the finer details of the Pegasus 32 in microscopic detail, accompanied by dozens of images. This will help you understand the Pegasus 32 at a deeper level, and whether it is worth the pricing premium. We also get a lot of questions asking how the Pegasus compares against other (similarly priced) neutrals within and outside of Nike. So we’ll preempt that by throwing in a brief comparison vs. the Saucony Ride 8, Brooks Ghost 8, Cumulus 17, Nike Vomero 10 and the Zoom Elite 8. Tempted? We knew you would stay. Thank you. Looks familiar? Yes, engineered mesh it is. Majority of the refreshes on the Pegasus 32 are packed on its engineered mesh upper, so let’s start poking around in those parts. 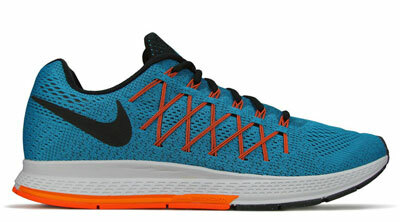 The 2015 model is built on the identical upper last (form) as the Pegasus 31, hence carrying over the familiar silhouette aesthetics and fit profile. That being a constant, the upper materials and patterns get an update. Toe bumper of the Pegasus 32 with the mesh folded over; comes with an inner stiffener like last year. The toe bumper and overall forefoot looks like a straight lift from the Pegasus 31. You’ve got the pointy looking tip of the shoe, the shallow toe bumper shaped by the internal stiffener, and the ceiling made of engineered mesh. For those not familiar with the latter term, it just means that the mesh is open-knit in certain areas, and denser in other parts, with the goal of mixing ventilation/weight reduction and structural support together. 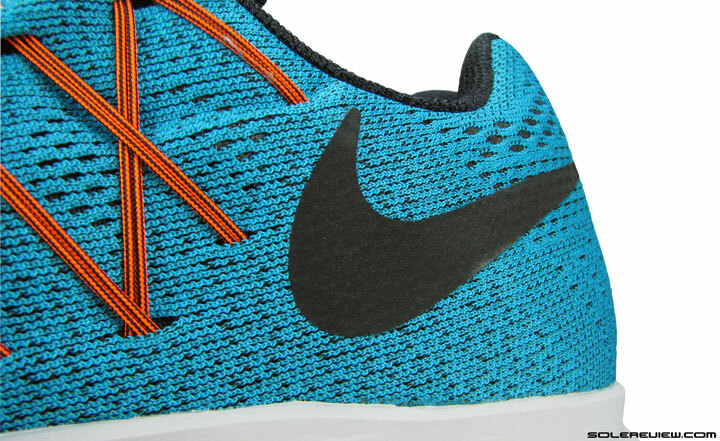 This mesh construction along with the Flyknit variety has now become an industry standard, and hence a commonplace sighting on many other models. This isn’t saying that the forefoot is without changes. 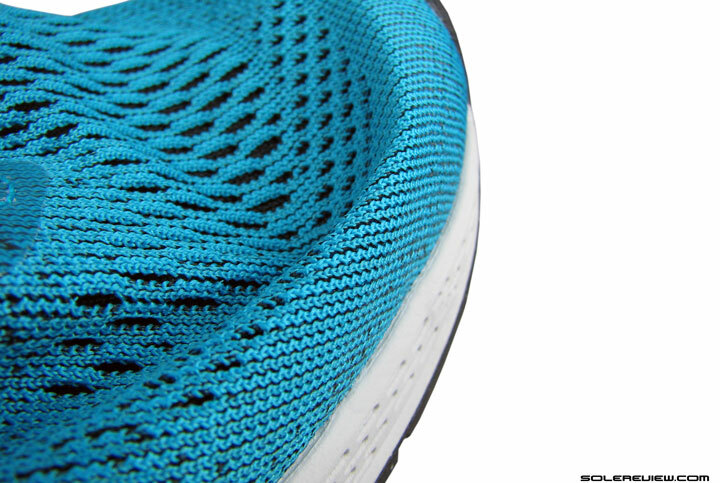 The engineered mesh design is open and closed in the same places as the Pegasus 31, but with a slightly revised texture. The toe-puff which gives the bumper its prominent shape is lower than that of the Pegasus 32, with obvious implications involving upper fit – something which we’ll spend some time discussing. The midfoot, though, is another tale. 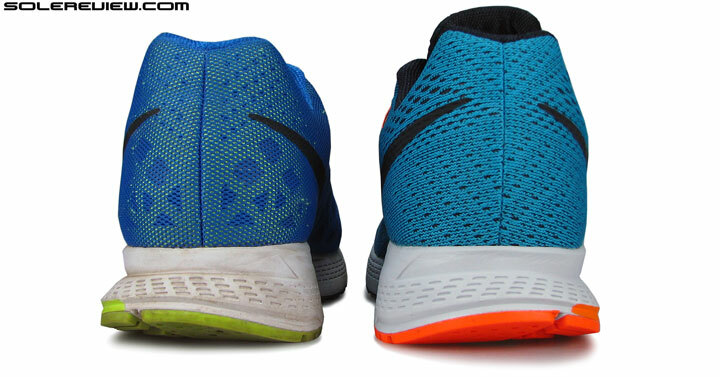 There are a number of material and feature revisions here, and their combined influence is responsible for the fit difference between the Pegasus 31 and 32. On the Pegasus 31, synthetic leather overlays were used in abundance, beginning at the forefoot sides and ending just at the base of the molded heel counter. The entirety of the midfoot panel was made of this, with diamond shaped windows acting as means of ventilation. 1) No synthetic layers around the forefoot or anywhere else 2) Identical midsole design, slightly softer foam 3) Heel Zoom Air stays put in the rear. The Swoosh logo on either sides is the only non-mesh (overlay) component, and even that sees a dimensional decrease. This part is now swapped out with the engineered mesh, which extends far beyond the midfoot and wraps around the heel. This uniform approach leads to the Pegasus 32’s upper now ending up as a single piece design externally, with only an invisible seam joining either ends at the heel. Even the Swoosh logos are downsized, the familiar trademarks shrinking in dimension. Logically, the effect of layering removal should be reduced weight, and that is indeed the case on the Pegasus 32. Compared to 323 gms/11.4 Oz of the Pegasus 31, the 2015 Peg 32 shaves off 16 grams, ending up at a respectable 307 gms/10.8 oz. There used to be a time when 350 grams/ 12.3 oz was the median for this category, but now the new benchmark is set higher at around 300 gms/10.6 oz. Nike isn’t alone in this weight club; the 2015 Saucony Ride 8 actually has a leg up on it – a sub-300 gram shoe which belies its aesthetic bulk. No synthetic layering, no problem. A filmic laminate fills in instead. The outer laminate might not cut it on its own, so there’s a backing reinforcement inside to prevent those round things from tearing off. To make up for the lack of structural reinforcement provided by the synthetic layering, the eyelet area has been strengthened by use of filmic laminates. We recently saw a similar execution on the LunarTempo; parts of upper mesh overlaid with a transparent film. 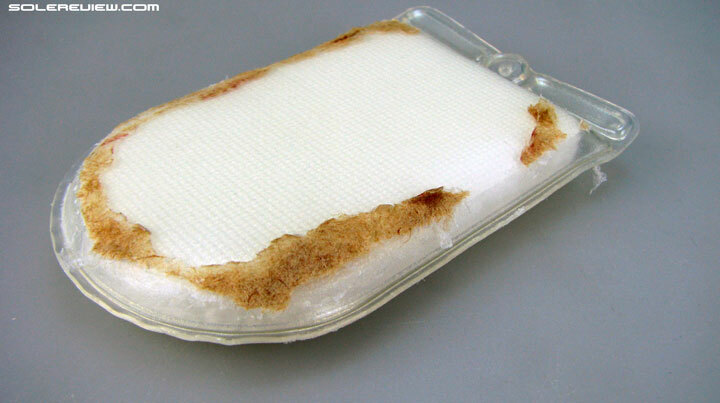 If left alone, the mesh would be susceptible to fraying, a process which does not end well. 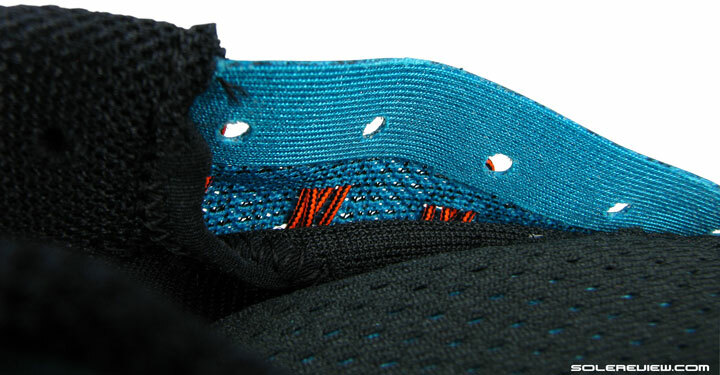 The innards are backed with a separate layer of eyelet tape, a component you’ll see when you turn the eyelet panel over. The Flywire fever gets the Pegasus too. Flywire assisted lacing makes an appearance for the first time on the Pegasus 32. This was inevitable, if you take into account the gradual alignment of other Nike models (Vomero, Elite, Free) with the minimal, Flywire featuring standard. The Flywire treatment has evolved over the last couple of years, and in a good way. From a single cord based design (Vomero 9, Zoom Elite 7), the strands are now double loops, resulting in a toned down (in terms of pressure) yet effective midfoot wrap. 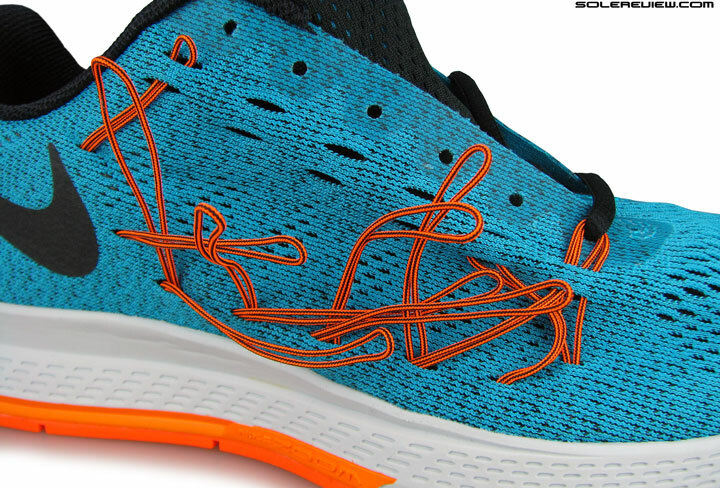 Lacing gap over the tongue and spacing stays the same on the Pegasus 32. 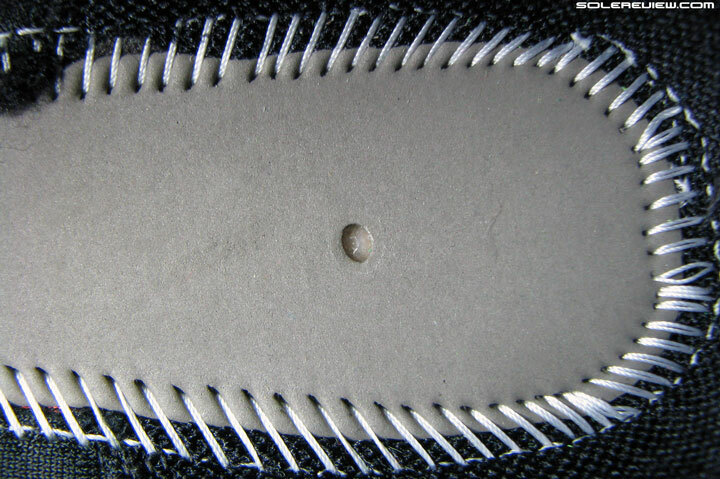 That being a common denominator, one of the eyelet holes closer to the heel has been removed. 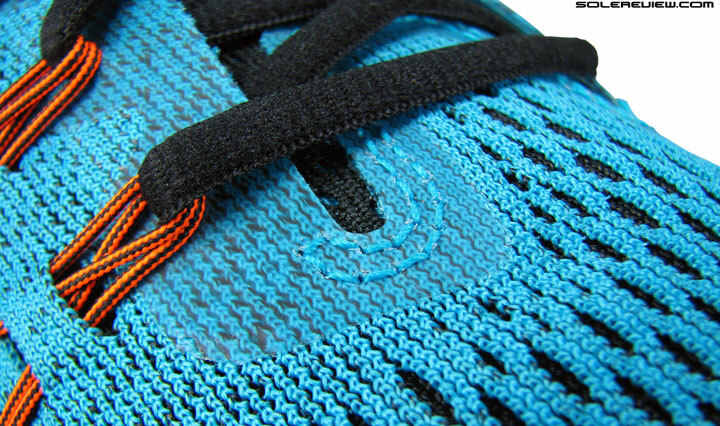 Not that it made any difference on the Pegasus 31; it was below and between the fifth and sixth (last) eyelet. 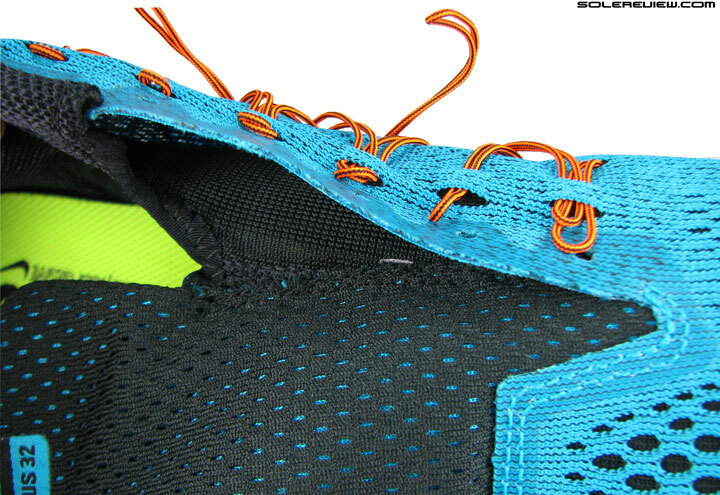 Not the same as having a heel lock eyelet, which shoes such as the Vomero 10 include. The upper is partially sleeved, which still makes for a comfortable midfoot wrap. That portion of the tongue stays unattached. A partial sleeve is a good middle ground between a full-bootie and un-sleeved. Makes getting inside easier. The entire lining from early midfoot to inner forefoot is seam free, except for the tongue attachment. The Pegasus 31 introduced a partial inner sleeve, and that stays unchanged on the Pegasus 32. The inner lining is two piece – a single mesh covering the mid and forefoot, with the plusher collar mesh taking care of rearfoot. The tongue is attached to the forward lining, and forms a midfoot sleeve wrapping around the foot. However, this isn’t the authentic bootie construction experience, so you have a portion of the tongue remaining which stays independent, but without any sliding behavior. The collar padding feels thinner on the Pegasus 32 than the 31. 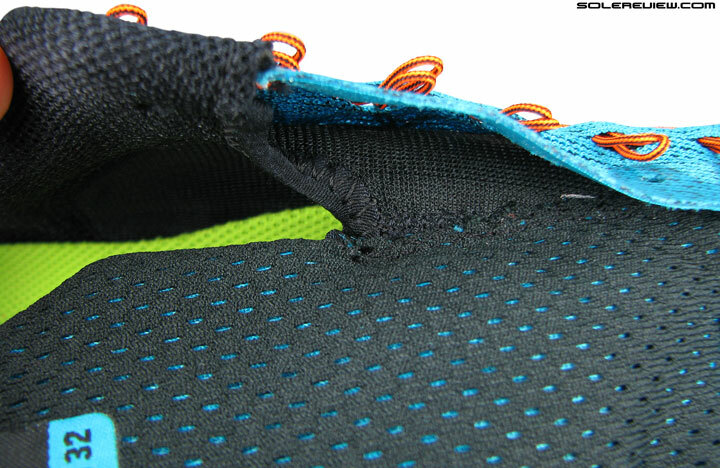 Around the heel area, the foam padding inside the collar walls feels thinner than the Pegasus 31. 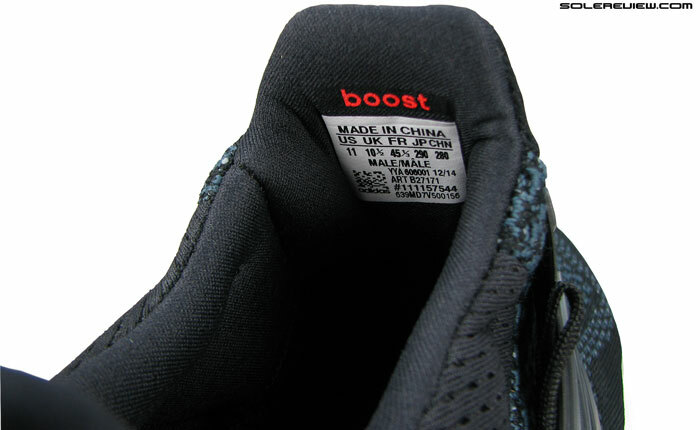 Yet, we believe that it does not have much of a connection to the foam volume, but rather due to the material switch on the outside heel. 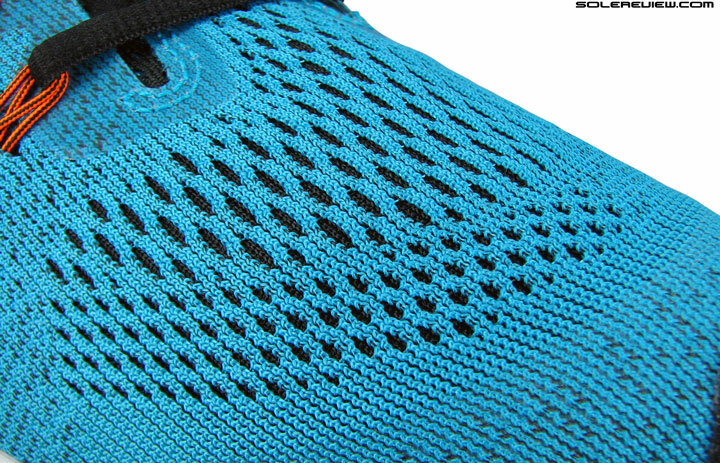 The Pegasus 31 heel housing had an open mesh over a layer of synthetic, including a few reflective bits. This added more ‘chunk’ to the area, and likely the reason why the collar padding felt more substantial without actually being so. The heel portion has been cleaned up. No reflective windows, only mesh. None of that on the Pegasus 32; the densely knit engineered mesh forms the outer heel covering, replacing the multi-layered design. This reduces the thicker feel around the upper heel, and in addition to all that, the Pegasus 31’s heel was marginally higher. This design update comes with a downside. The reflective elements vanish, making the Pegasus 32 completely non-reflective at night. If this was a feature you valued on the Peg 31, then sorry, you need to stick to the older Pegasus. The slew of changes yield a different quality of upper fit than the superseded Pegasus 31. There are two levels to this experience; we had a different opinion when we wore the Pegasus 32 for the first time, and that opinion slowly evolved over a week of running. Because the things you notice for the first time during an in-store wearing or even the first run doesn’t necessarily match up with your thoughts after a longer ownership period. If the Pegasus 31 toe-box wasn’t shallow enough, the Peg 32 tip swoops lower. Two meshed tongue with foam packed inside. More functional than plush, and helps absorb lacing pressure. 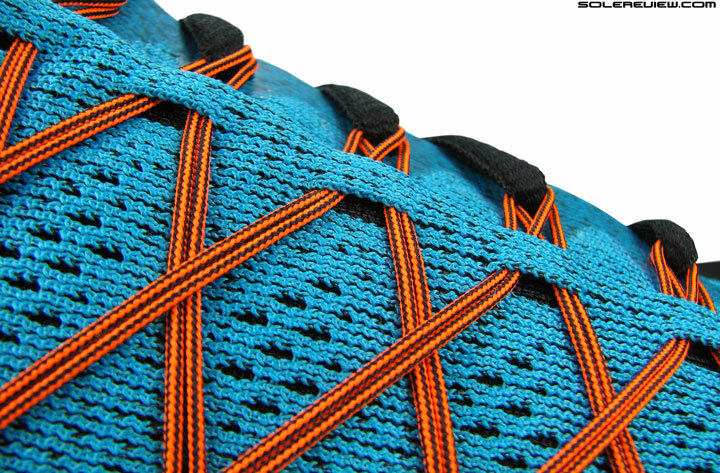 The first row of Flywire (right) increases forefoot wrap. And what happens when you unlace the cords? You need a picture reference to put them back the way they were. Serious. Straight out of the box, the forefoot feels narrower and the toe bumper shallower. Makes perfect sense, since the toe stiffener is indeed shallower, and there’s some Flywire spill over from the midfoot. Tighten up the laces, and there’s a greater lockdown feel around the midfoot, but without the lacing top down pressure. 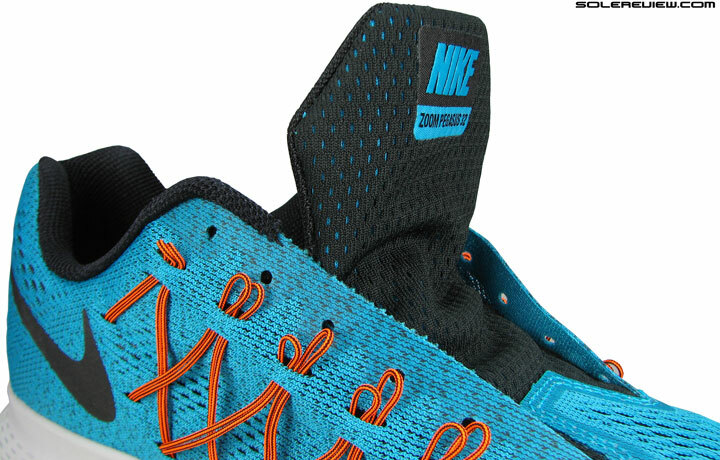 The laces are span wide, and are spaced closely, and this kind of design always goes easy over the foot. The tongue has some amount of padding, so that dilutes the cinch too. An oddity in Nike’s line-up, when all the other shoes are getting toe-box room upgrades. 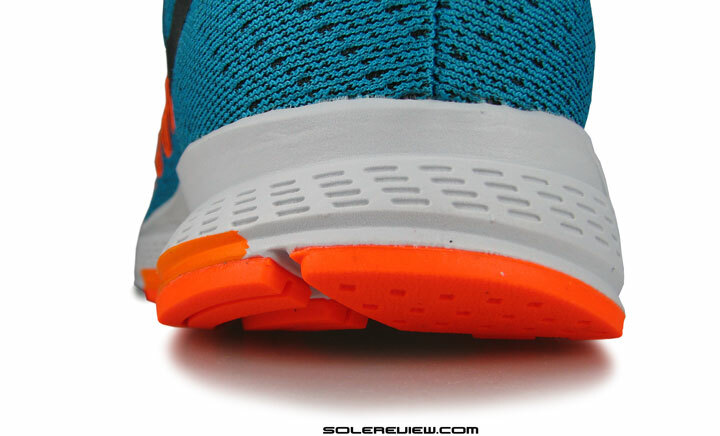 It is puzzling however, as to why Nike chose to lower the toe bumper on the Pegasus 32. If you look at the recent trend in their shoes – be it the Vomero 10, Zoom Elite 8 or even the Nike Flyknit Lunar – all of them now come with higher toe-boxes and increased forefoot room. For obvious reasons, the shoe will be a disappointment for runners expecting an upper fit which harks back to the well rounded Pegasus 30 – or specifically speaking, a roomier forefoot. Conversely, it can be said of the Pegasus 31 that it is almost like a ‘comfort’ version of the Peg-32. Put in around 30 miles on the Pegasus 32, and one will discover that the shallower toe-box and snugger forefoot isn’t an issue, at least relative to the Pegasus 31. The toe-box does not feel any better or worse than how it was last year, and the forefoot fit isn’t as narrow as you thought it was. The first row of Flywire loosens up as you put on some distance, but still maintains a fit difference vs. the Pegasus 31. 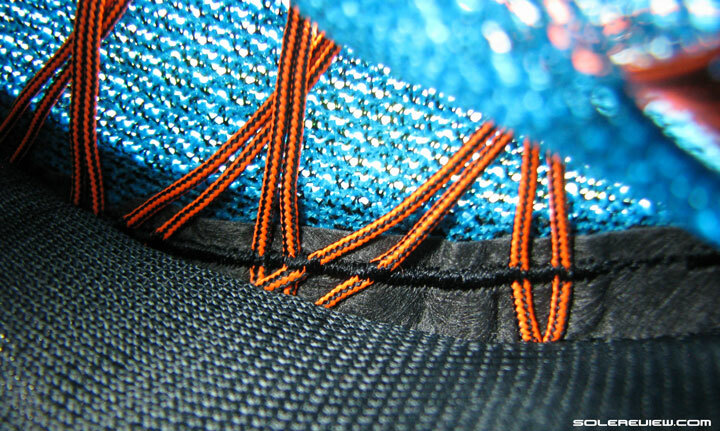 The origins of the Flywire cords lie deep inside, between the two mesh layers. From a performance perspective, only two things stand out. The midfoot lockdown is definitely greater on the Pegasus 32, as the shoe goes from a relaxed feel (P-31) to a snugger interpretation of how it once felt. And then there’s the topic of the heel grip. 1) Toe box is shallower 2) Higher midfoot grip, but with no top down pressure 3) Collar feels slightly less padded. For reasons mentioned earlier in this review – chiefly the reduced material layering and the drop in upper heel height – the sense of wrap is a rung lower than the Pegasus. It isn’t blatant, but run alternatively rotating the Pegasus 31 and the 32, and one can tell the fit difference, though small it might be. If you’ve noticed, Nike (at least in the US) has started offering multiple widths in the standard Pegasus. One has the option of regular/wide/extra wide , which wasn’t the case earlier. So theoretically speaking, you can choose another width if you find the forefoot tighter than how you’d want it to be. 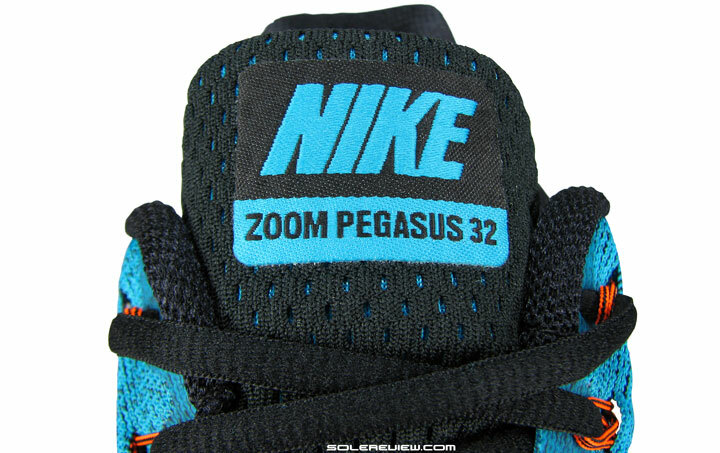 The sole platform the Pegasus 32 is based on is exactly the same as the 31’s. Twin midsole design, and outsole to match. So it is the familiar Pegasus 31 landscape one will have no trouble identifying. 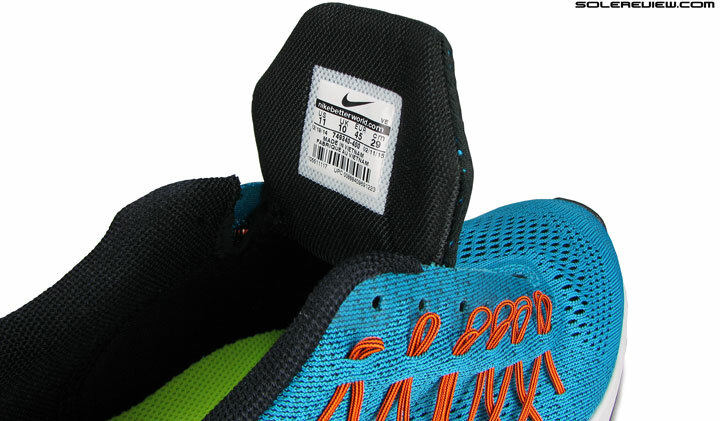 A single piece EVA foam unit (Nike calls it Cushlon) separates the upper from the outsole, with different treatment of medial and lateral sidewalls. The medial midsole walls are flatter, more supportive. On the lateral (outer) side, a deep groove splits the top and bottom parts of the midsole. 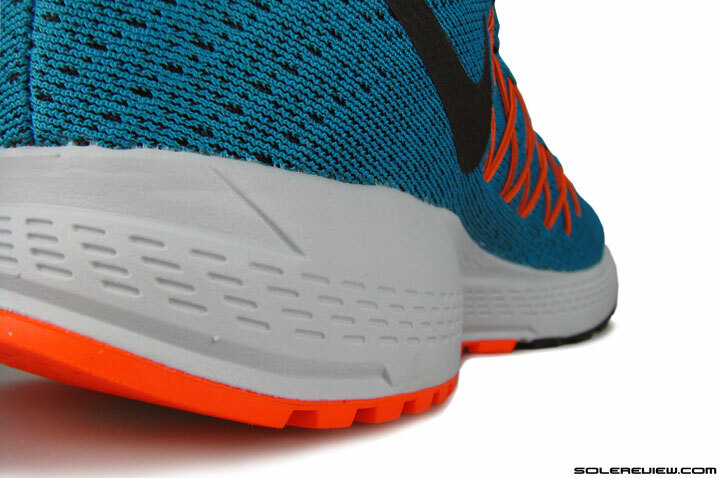 The soft under-arch flare; you’ve seen on this on the Pegasus 31 too. 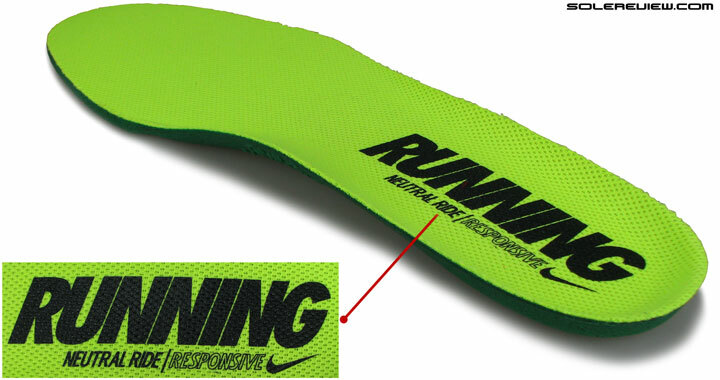 Medially (inner side), the midsole wall is flat, save for the flare which runs under the arch. On the outer side, a deep ridge splits the upper and lower midsole in a 25:75 split. This is meant to induce a minor degree of lateral bias by making compression easier, also translating into more gradual transitions. If you excavate the heel midsole, this is what you’ll discover. A large Zoom Air bag, with cardboard/cellulose sheet on top. Cutting open Zoom Air will show you how it is put together. 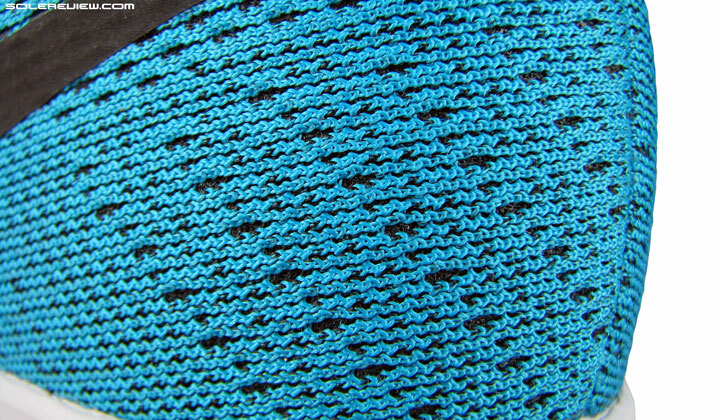 A drop stitch design with thousands of fibers connecting the top and bottom walls. A heel only Zoom Air is encapsulated inside the midsole, a pressurized chamber made of Urethane and internal fibers. This rebounds on impact or weight loading, with the fibers helping maintain the structure of the bag. We’ve included a picture here, and though it might not seem like much, this is a sizeable unit. Precisely speaking, 80 mm long and 50 mm wide, with a thickness in the region of 2 mm. The forefoot is just EVA foam, and unlike the Vomero 10 or the Zoom Elite 8, it does not feature Zoom Air. The paper board sheet is visible through the hole in the foam lasting. Below that lies the Zoom Air unit. In recent years, Nike has started overlaying the heel Zoom Air with a piece of cardboard. While the exact reasons for doing so are unclear, we think it helps keep the Zoom Air unit from moving around, and also spread the weight wider instead of being localized. We experienced this in the Zoom Streak 5, where a near direct contact with the Heel Zoom led to the sensation of a cushioning imbalance between the rear and forefoot. Shared part with the Pegasus 31, no update here. Looks like Ortholite, but it ain’t. It really looks like Ortholite, though, with all that open foam going on. Feels like one too. On the Pegasus 32, you can see this cardboard through the small lasting hole. A sheet of EVA foam lasting goes over this, topped off with an open foam insole carried over from the Pegasus 31. The midsole foam is marginally softer than that of the Pegasus 31, thus increasing forefoot flexibility by a midge. But here’s the interesting bit, none of these have any impact whatsoever on how the Pegasus 32 rides. The gains in flexibility – at least to the point when you can sense it – is lost during running, and the seemingly lower density EVA does not make the Pegasus 32 ride softer. From a performance standpoint, the 31 and 32 ride identically. If you’re a forefoot striker who is extremely perceptive, then yes, maybe you might be to tell the infinitesimal bump up in midsole softness. But for rear-foot strikers, you won’t feel any performance difference. And here’s why. The midsole foam might be softer than the Pegasus 31, but does not translate into a softer ride. 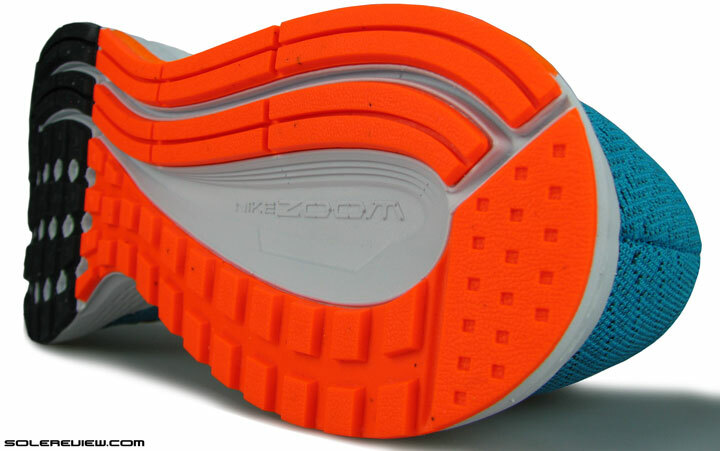 As far as heel cushioning is concerned, the large Zoom Air insert is the dominant component. So basically your rear-foot strikes are being shouldered by the combination of Zoom Air, foam lasting and the insole, which was the case for the Pegasus 31 too. Midsole’s role in this case is limited to being just a supportive structure, and much less of a cushioning influencer. Contrast this with the forefoot area, where the entirety of weight loading involves the EVA midsole. 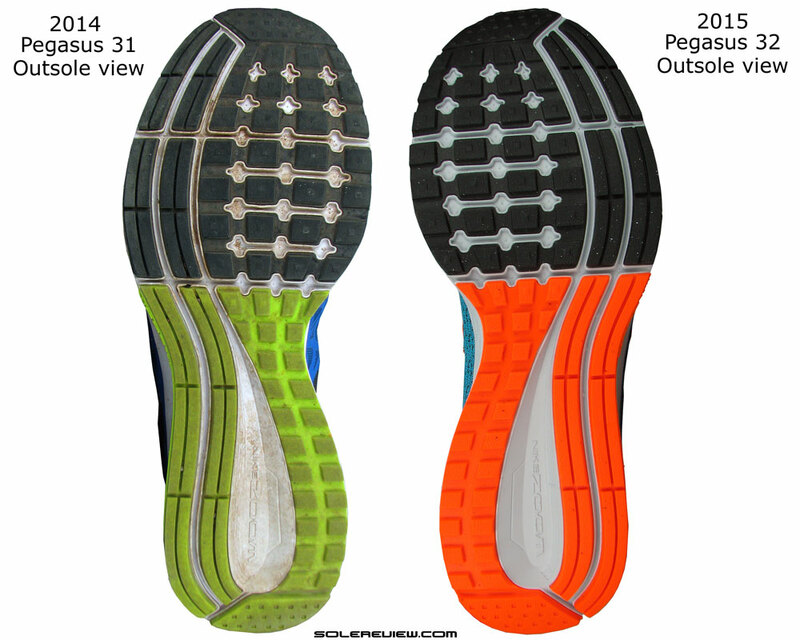 Ditto Pegasus 31 (left) outsole design for 2015. This design results in the rearfoot area being substantially more cushioned and responsive than the forefoot, which is relatively minimal in feel. Yet, the Pegasus 32 manages to successfully pull-off a smooth transition, as did the Pegasus 31. And this is why the whole cardboard-over-Zoom deal is slowly growing on us; it creates a more seamless heel to toe experience by equalizing the midsole density across. Zoom Air is noticeably softer than the EVA it comes packed in, and the cardboard helps fill the gap in density. Transitions are quick and smooth, and the difference between heel and forefoot cushioning levels notwithstanding, there is no lag. The Pegasus 32’s ride is a satisfying meld of fast and cushioned, which also feels efficient and economical. Cushioning does not come at the cost of being mushy; the Pegasus 32 does a neat balancing trick here. However, cushioning is one thing, responsiveness, other. Though the transition is smooth, the springback levels of the heel and forefoot differ vastly. 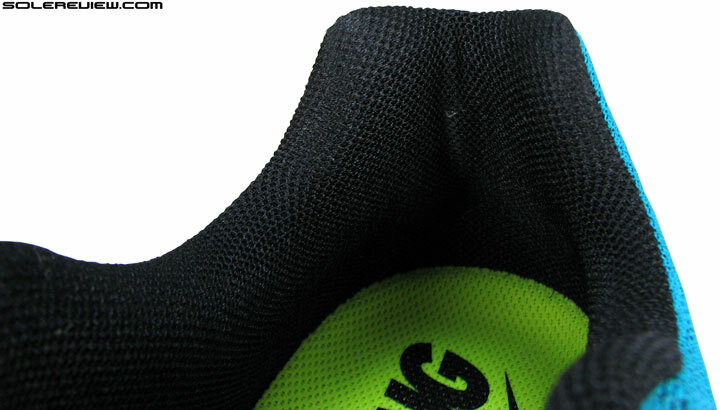 The heel part is very responsive, a feat achieved by the Zoom Air bag packed tight with gas. The forefoot has nothing, hence it feels much flatter and not very responsive to speak of. Now, if you’re a forefoot striker, this could mean one of the two things. You’ll probably find the forefoot cushioning levels sub-par, especially when the shoe is used for long runs. Or, you will like the forefoot’s higher ground feel, something which the heel muffles out. So if you are looking for a running shoe which behaves differently under the forefoot, it is worth reading up our comparison notes outlined below. The outsole merits a mention because its contribution to the overall ride quality is significant. Take for example, the ‘crash rail’ design, which made its debut on the Pegasus 31. It is that twin strip of outsole rubber which borders the lateral side. There are other factors like a full contact outsole and a beveled heel – both of which have notable weightage when it comes to polishing the quality of transition. 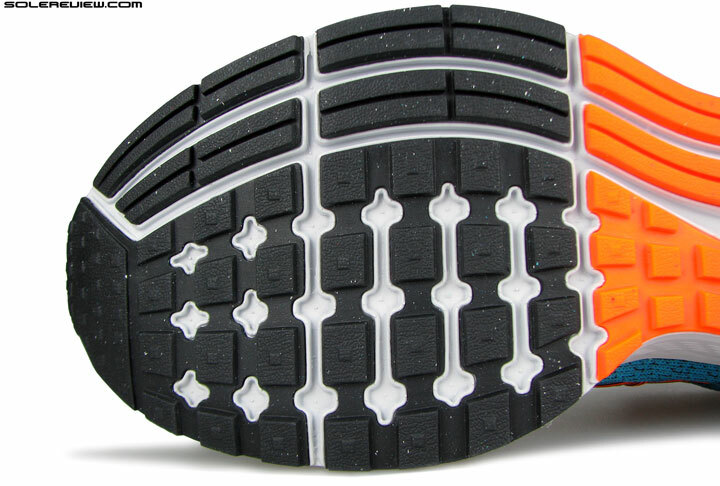 Very durable outsole rubber, and has some recycled content too – see the black specks mixed with red. The outsole also happens to be very durable, based on our ownership of the Pegasus 31. By opting to use a 100% carbon rubber outsole instead of a blown+hard compound layout, the outsole life increases by much. The only other comparable shoe in this category is the adidas Glide 7 Boost, which makes use of a full coverage adiwear carbon rubber outsole. There is a slight degree of lateral midsole lean under the rear-foot, given the split-ridge design. So when it comes to delivering a supportive ride, the Pegasus 32 does not fare badly, but certainly less than some of the other shoes. We did say that we’ll include multiple shoot-outs involving other models, a discussion we’ll arrive at in a few moments. As a sum of parts, the Pegasus 32’s road manners are pleasant enough. There’s adequate cushioning coupled with the sensation of efficient weight transfers; it feels fast relative to its category and heel drop (10 mm), and lastly, it is light enough to go the distance. The shoe is ideal as a daily trainer – both for short and long runs, slow and medium pace. What the heck, even for walking around town. That having said, we’d still prefer to get something quicker and lighter (like the LunarTempo) for race days and those high speed workouts/intervals. Owing to its heel-to-toe Powergrid foam insert, plus the crash pads under the heel, the Ride 8 is more cushioned/softer than the Pegasus 32. The Ride 8 is lighter, and has a more supportive midsole feel, mostly due to the prominent outwards flare – both under the heel and forefoot. The Pegasus has one up over the Ride 8 when it comes to responsive heel cushioning; the Zoom Air unit trumps over Powergrid in that aspect. That, and the single density forefoot makes the Nike go faster than the Ride 8, with a sense of higher ground feel. 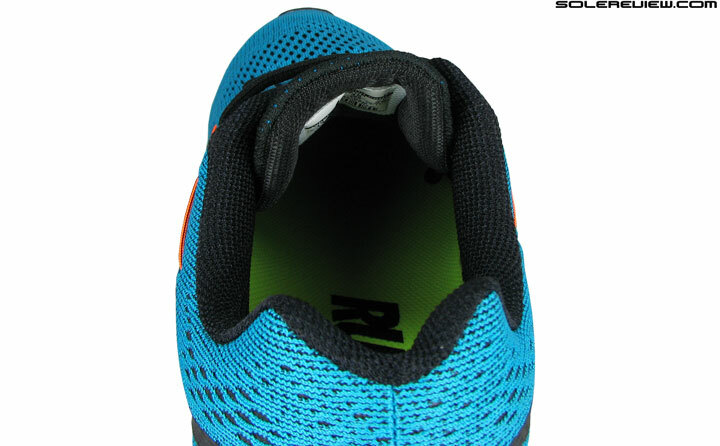 On the upper front, the Saucony Ride 8 has a snugger collar, and is laterally tighter in the forefoot. There is no tongue sleeve on the Ride 8, so there’s some slide as well. The Saucony Ride 8 also has more reflectivity, compared to nil on the Peg 32. The Vomero has a more supportive heel because of uniformity in sidewall design, and the ride is more cushioned because of dual Zoom Air bags, Lunarlon foam and the Ortholite insole. Flip side? It doesn’t feel as fast as the Pegasus due to all that layered cushioning. The toe-box and forefoot is much spacious on the Vomero compared to the tapered front-end of the Pegasus 32. 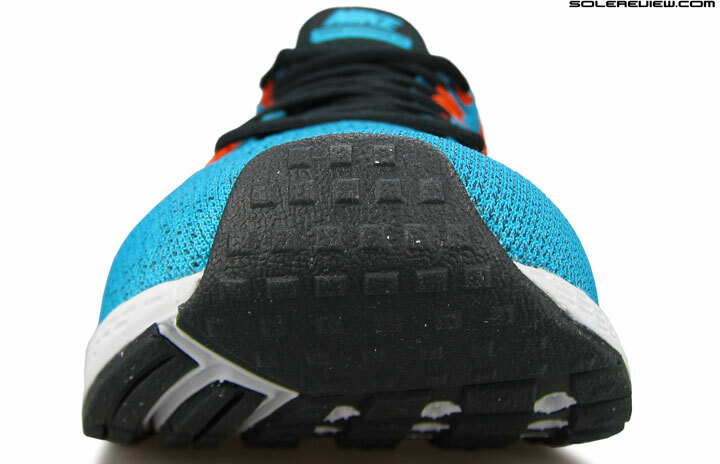 Midfoot grip is higher on the Pegasus because of aggressive Flywire-ing – six columns vs. just four on the V-10. The new Ghost 8’s upper looks drop dead gorgeous. However, there’s too much layering over the forefoot which tends to bend in, compared to the more liberal feel of the Nike Pegasus. 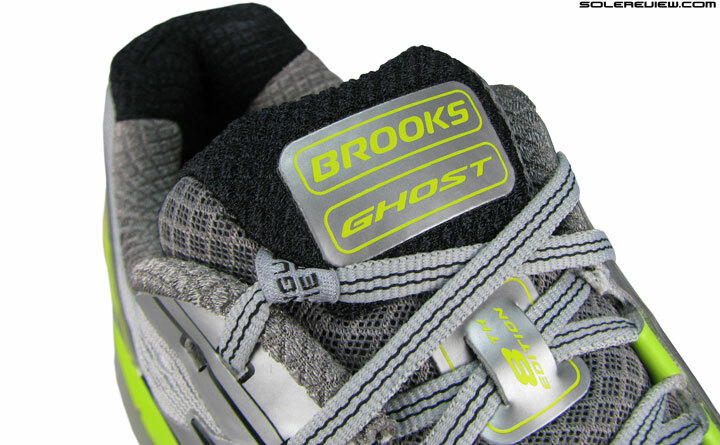 At a material level, the Ghost 8 upper is plusher than the Peg 32. It rides softer than the Pegasus; at the cost of lower responsiveness and reduced sense of speed. The G-8 midsole is more supportive than the Pegasus, but comes with a weight penalty – 10% heavier to be exact. Think of the Elite as a reverse Pegasus; Zoom Air is taken off the rear and transplanted up front. The midsole ride is firmer which makes the Elite feel much faster, and the new Flymesh upper opens up more room. There’s less rubber on the outsole, and of a different kind. Blown rubber under the forefoot, and carbon type in the back. An easier way of classifying both these shoes would be through a footstrike lens – the Nike Pegasus being for rearfoot strikers, and the Elite being a better tool for forefoot runners. A different breed of neutral running shoe, which has a very soft heel cushioning and an unusually snug collar on the upper – especially around the Achilles area. The forefoot and midfoot happens to be narrower than the Pegasus – more layering and a different last which determines the fit quality. The Cumulus 17 rides lazier than the Pegasus, mostly due to its soft midsole construction, and is heavier by over 10%. Hope all that was helpful, putting the Pegasus 32 in a comparative context. Just two things you need to know – narrower forefoot, and snugger midfoot. We began this review with a summary, and we’ll counter balance the conclusion with one. The Pegasus 32 scores over the 31 if changes like a slightly narrower forefoot and higher midfoot lockdown mean a lot to you. As far as everything else is concerned, the Pegasus 32 happens to be just a close variant of the 2014 recipe. The midsole rides in a near-exact likeness of its former edition, and if that was all what mattered for you, then the sensible next step is to snag a few pairs of the Pegasus 31 – for real cheap. 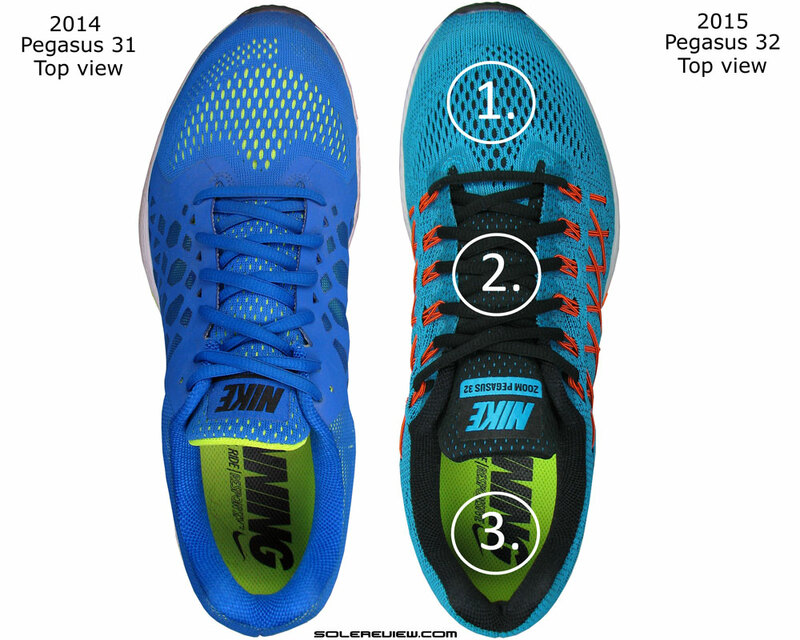 Looking to upgrade your older Nike Air Zoom Pegasus 31 to the latest version, but not sure how the 2015 model compares? We can help here. The following infographic is a ready-reckoner for what changes you might expect in the new model vs. old. To make this more fun, we’ve put in a system of percentage match, which calculates a weighted average for a set of attributes. Yet another amazingly detailed review – thank you, I think this has finally convinced me not to have a pair of Pegasus on rotation for this season. Interesting what you say about the Pegs being aimed for rearfoot strike and the Elite for forefoot – I posted in another review that although I loved the Peg 31 something never quite felt 100% right and that the Elite when I tried it instantly felt more natural, and this might be it, that with the Pegasus there was always this mild sense that it was fighting against my natural forefoot strike almost willing me to heelstrike! That said the Peg is still a very good shoe, as an aside which out of the Elite and the Lunar Tempo would you recommend for speed work (road) and marathon distance races? I’m pairing the Pegasus 31 and 32 with the Zoom Elite 8. Pegasus for most of my runs, with the Elite 8s for the faster stuff, and I’ve really been pleased with the Elites. I’d say it’s a really good middle ground between firm and soft. It’s definitely cushioned–running on the road is no problem with a forefoot strike (woe be to him who tries to heelstrike in them, though), but there’s no sink in, and overall I’d say it feels pretty fast. Yes, we remember that comment about the Pegasus vs. the Elite. Out of the Elite vs the LT, we’d pick the Tempo. The shoe is much lighter than the Elite, and has an even cushioning spread too. I’m a forefoot striker and for the past year and a half I have been running in the Peg 30, and yes, it does feel like its making you heel strike. I noticed this is especially true during long training runs when the body is getting fatigued and the running form collapsing. Personally I kinda feel like this is what the Pegasus was designed for, to help you get through a long run with the heel zoom air for the extra “push” at the end of a run. I have ran in both Elite 7/8, and while it felt nice and fast, I kind of miss the heel zoom air during long runs. Which shoe is that new picture of the zoom air bag from? The Vomero. Pegasus uses the same air bag. Thanks for the deep review! Just wondering how do you score the Heel Cushion on Peg32 (7/10) vs Peg31 (9/10) ? As you mentioned above Peg32 has the same Heel Zoom Air as 2014, and Identical Insole & Outsole, what make Peg32 scored 2 point lower than Peg31 ? Great question. This also reminds us (again) that we need to do far better job at explaining how our scoring system works. Hopefully soon, we’ll have a page detailing the scoring and review methodology. We noticed that difference (sensory scorecard of Peg-31) when posting the Pegasus 32 review, but did not go back and change it. Because the sliders on the sensory score are relative to the shoes reviewed before it. So for example, when we reviewed the Pegasus 31 over a year ago, we did not have much experience with other models, so within that context, the Pegasus 31 heel felt very soft. After that, we’ve posted close to 100 reviews, and hence our frame of reference has widened. We’ve got supersoft shoes like the Nimbus 17, or the Clifton, which has an amazingly deep level of midsole cushioning. 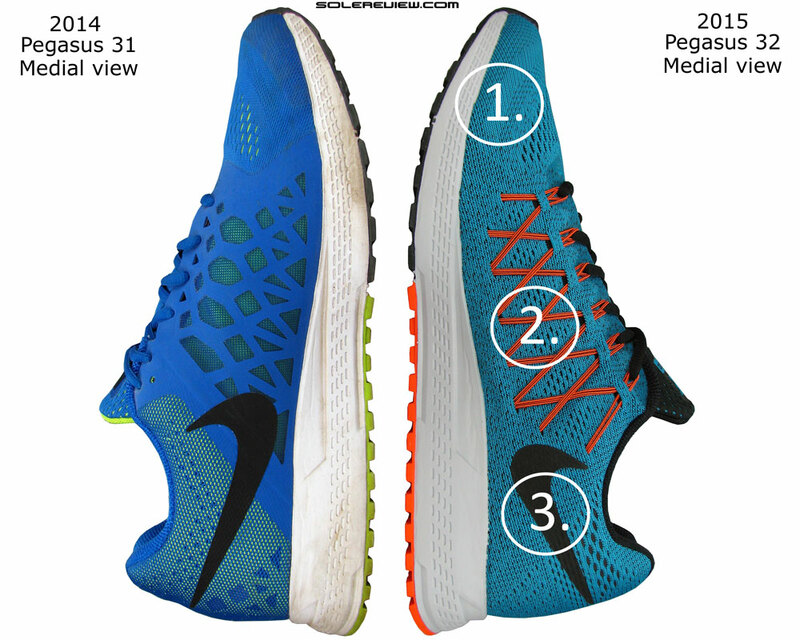 So if we apply the same context (of the Pegasus 31) to the Peg 32, it would not make sense, because there are other shoes which rank higher than the Pegasus 32 on softness of cushioning. Does this make sense? This is not ideal, but an inevitable part of our learning process. Once we cover most of the brands in the next year, the sensory scorecard will truly become balanced. thank you for your humble explanation ! It does make sense. Thanks very much for this review! I guess you could say nike’s cardboard strobel is it solution to unlock the zoom bag just like the hordan flightplate system? very interesting points and your sacrifice and measurement of the zoom bag is much appreciated! Great review. I notice that in a few places you note that a shoe “feels faster”. Peg 32/general question: do you think that the Nike Zoom is generally faster than Lunarlon (i.e. to you lose energy, propulsion speed due to the softer material) or is it more just about feel? So Zoom Streak vs. Lunar Tempo, Peg vs. Flyknit Lunar or Lunar Glide? A step further what about something like Hoka that is even more cushioned–actually giving up speed or really personal pref/”feel of speed”? 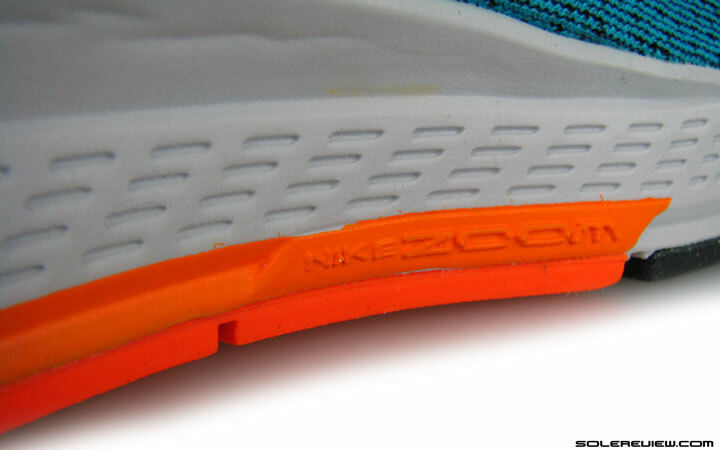 As standalone cushioning technologies, the Zoom Air does feel faster than Lunarlon. Is firmer and tightly compressed with gas, so the rebound is much better. But how ‘fast’ or efficient the shoe feels (or not) depends on the overall design. Like how the Hoka Clifton’s lighter weight, stiffer forefoot/rockered design and responsive midsole cushioning prevents the shoe from feeling slow, despite its cushioning. A terrifically comprehensive piece of analysis: thank you! Based on your remarks above and some of your replies in the Vomero 10 review, my guess is that although the Peg32’s introduction of double-loop Flywire would alleviate some top-down pressure compared to the Peg31, the slight reduction in forefoot width in the 32 means that the Vomero is now an even better solution in that respect, and your comparison of forefoot cushioning above would seem to seal the deal in favour of the Vomero. The one thing that still intrigues me about the Peg32 is that the Flywire appears to have been extended one higher and one lower than the Vomero (6 vs 4, as you observe), so that the top (standard) eyelet of the Vomero is replaced with another Flywire double-loop at a crucial pressure-point. Would guess that I’m on the right track in considering an 11 4E Vomero 10 as my only real option, or would the Peg32 (or even 31) be an option? Yes, the cinch pressure is more effective around the tongue top for the Pegasus 32 vs the Vomero – for the reasons you have pointed out. You’re on the right track with the Vomero 10. Much more forefoot room than the Peg 31/31, Nimbus, 1080, though we’d suggest you first try the regular width in-store before going for that special order. Thanks: a very helpful expansion on the review. I did try the Peg32 and V10 in a D-width at a local shop, and while the V10 was much, much better in the forefoot, I’ll definitely have to try a wider width when I’m down in the US, or do a try-and-return. To my surprise, I might be able to get away with the ‘Wide’ Vomero (same outsole and midsole as the ‘Regular’ width, but higher volume upper) rather than the “Extra Wide” (wider outsole and midsole, even more upper volume), but that will probably require a direct comparison. I suspect, ultimately, I’d be better off in the Vomero because of the forefoot cushioning, but that the improved cinch pressure of the Peg32 (which you have described so well) may be an overriding factor. In your view, is there a big difference in how heel and rearfoot fit between the V10 and the Peg32? My feeling was that the Peg32 fit much more closely behind the arch, but it was really hard to tell because of the deformation of the uppers (thanks to my ridiculously over-wide hooves). In your view, does the V10 or the Peg32 offer more ‘depth’ (for lack of a better term) between the strobel and the top eyelets, or are they about the same in that vertical dimension? I know this depends quite a bit on the shape of the upper and how it wraps the foot, but any general guidance would be much appreciated. I have to say (though this may make me sound ignorant) I would never have considered Nike shoes but for your reviews; they’re now my primary targets. Best wishes for the Sauc. Ride 8 review! Sorry – this response got way delayed along with many others; facing technical issues over the last week which has affected our Ride 8 Review too. The Pegasus 32 fits much snugger than the Vomero, in the after-arch area. The reason for this is Pegasus’s use of Flywire, and the fact that the top eyelet sits closer to the heel vs. the Vomero, hence increasing rearfoot grip. Highest point of the Pegasus 32’s upper is higher than Vomero’s, by around 4mm or so. In simple words, more depth than the Vomero. Nike shoes have been getting a bad rep the last few years, but now they seem to have really got their act right of late. All of their recent releases have been been great. Thank you for the wonderfully detailed review once again! I always look forward to these. Well another fantastic review by the good folk at Solereview- thank you! I love that you have compared the Peg 32 to a few other brands and hope you will include that feature in future reviews- very handy…and will also save you replying to many readers questions I’m sure!! The Brooks Ghost 8, Saucony Ride 8 and Asics Culmulus 17 all look fantastic- and I love the color scheme on the Brooks and Asics- drools…I feel guilty but design and shoe color are important features to me when I pick out a new pair of shoes. Quick question….in the overall scheme of things- would I be correct in guessing that the Asics Culmulus 17 cushioning is above that found in the GT-2000 2 and Kayano 20 and below the Kayano 21 and Nimbus 17 sponge(!) ? I bought the Pegasus 31 based on your review and although a little too hard in the forefoot for me personally for running, I love it for everyday wear around town and a nice looking show too. “If you’re on the fence, wondering if it is a better idea to get last year’s Pegasus 31 on markdown prices, rather than ‘upgrading’ to the newest version – which happens to be the Pegasus 32 – let us give you a gentle nudge to help tide over the classic dilemma. And the above is why we all flock to Solereview. Thanks ! It is amazing how the Pegasus and Vomero hold their value. Best deals I can find are $89 for the Vomero 9 and $79 for the Pegasus. Other brands are reduced by a larger margin. Yes, noticed that too, the popular Nike’s never go rock bottom on pricing. There are exceptions on ebay and Craigslist, though. Thank you again for the outstanding review. It is very much appreciated all the hard work you guys put up together on this. Remarkable job! Will you be posting a review on the Nike Zoom Elite 8 as well? First, kudos for posting such a detailed review. I bought the 31 the day it was released last year. While I appreciated the step-in comfort, I did not enjoy the ride of the shoe. It felt too soft in the forefoot and seemed to have a lateral bias that seemed to disrupt my gait with every stride. The 32 seems to have a firmer forefoot (or softer heel) and a more neutral feel. Maybe different production runs produce different feel despite using the same material and design. Whatever the case, I am enjoying the 32 more. Perhaps, production variance is known to happen. Thanks for the feedback! That is so weird…I am enjoying the 32 more as well. Feels better. I have had the same experience. The 31 did not work for me. After two weeks, I stopped running in them and went back to my 30s. I have been running in the 32s for a month now. They are much more comfortable. In fact, I like them better than my 29s and 30s. There is no doubt that the heel is softer in the 32 versus the 31. No doubt at all. Two other people I now have recently been running in the 32 and they also confirm my experience. 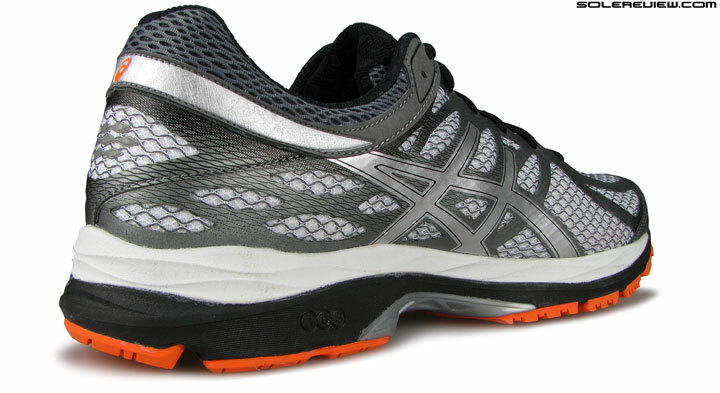 However, all reviews are subjective and the reviewer has a personal type of running shoe they are best suited for. For example, being a neutral runner, how would I ever be able to review a stability shoe? Being a neutral runner, I can confirm the 32 rides much better than the 31, and is worth the 10 dollar premium–even 30 dollar premium on discount–to attain a much better constructed shoe. I paid 42.00 dollars for my Peg 31’s. So it was the price differential that lead me to get these. After all saving $68 plus dollars seems only right. I’ve put 72 miles on them so far and they feel great. Great deal for a shoe which at its core, is the same as the Pegasus 32! Thanks for the thorough reviews! Keep up the good work! In terms of ventilation, between Peg 31 and 32, which do you think is better? I’m still wearing my Peg 30 and my feet gets very warm when I am doing runs in NYC. Do you think Peg 31/32 will be better in terms of ventilation? Also, will you be doing a review on the newly released Nike Zoom Odyssey? Specifically a comparison of it between the Vomero 10? We see the Pegasus 31 as better ventilated than the 32, but not by much. Yes, we’ll do a Nike Air Zoom Odyssey review, but sometime in September. What is your opinion on heel-to-toe drops? I want to try other shoes, but I’m afraid of venturing out into the world of higher heel-to-toe drops, such as the one on the Pegasus. I’ve read that higher heel-to-toe drops aren’t very good. Heel to toe drop specs should be taken with a grain of salt. For one, the published manufacturer specs for heel drops does not necessarily have a connection with the effective heel drop – when weight loading on footstrike (rear or front) occurs. In our opinion, that is the true measurement of a heel drop. Many pro racing shoes such as the adidas adios 2 Boost have relatively high drops, and that one’s pretty popular on the pro-circuit. Same for shoes such as the Zoom Streak 5. In short, we don’t think much of heel drops at all. You can heel or forefoot strike in any shoe you want to, even if it’s one with a 12 mm differential. Marketing by shoe brands aside, no research conclusively proves (with adequate sample size and correct control conditions) that lower drop shoes are beneficial in any form. Same goes for heel vs. forefoot striking. Ultimately, one has to go with what rides well and fits best at a personal level during runs. That could be a shoe with a 4 mm static drop, or for that matter 10 mm. First of all, thanks for your great reviews! I was looking for a fast shoe I could use for speedwork and some uptempo running. I already own a pair of saucony type A5 which I almost exclusively use for the race day and some isolated speedwork, because I find them really agressive. I also own a pair of new balance 890 V3 which I use as an all-round shoe for everyday training, so I would like something in the middle. Which shoe would you recommend? I weigh around 130lbs, 37:30 at 10K, and have no pronation problems. I was thinking about the new balance 1400 V3, would say it is a safe bet? Are you planning to write a review about that shoe? We haven’t tested the 1400 V3 yet (and not sure when),but from what we’ve heard so far, it does seem to be your type of a shoe. What are the main differences between the Pegasus 31 and the 32? Please refer to the scorecard above and the whole review. Hello, i running with Peg 30 and it’s time to replace them. i had the Peg 27 and Peg 28 and thought to upgrade to the 31/32. I’ve read your reviews on the Peg 31 and 32 and i’m worried about the heal cushion. 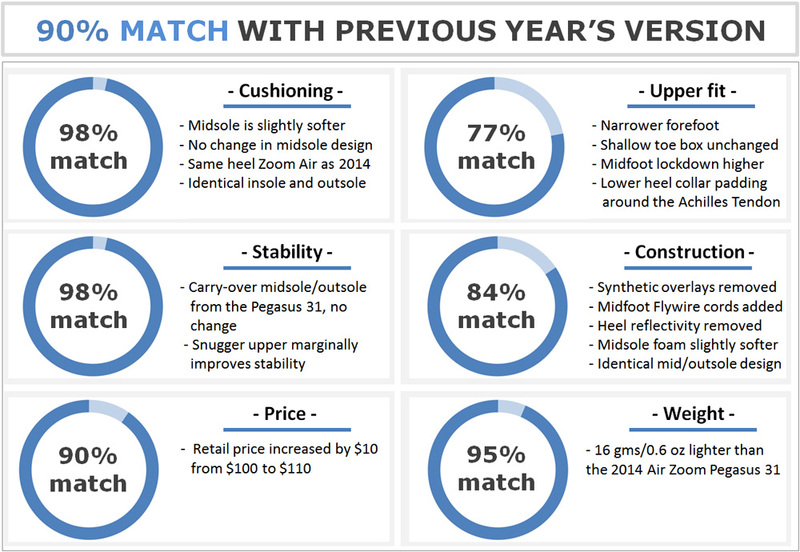 As i understand from your reviews the heal cushion of the new models is not as good as the Peg 30 and earlier model. If so, which other running shoes would you recommen to try and would give good support to the heal? I usually run around 10 KM. You should try the Vomero 10, the New Balance 890 V5, 1080 V5 and see how they feel in the rear. Have to admire Nike for their innovative design on a lot of their latest shoes- choice of material, construction quality and overall thinking outside the box approach. Yes, they have really improved, as if with a renewed focus on details. Cumulus 17 review will be up sometime in September. I need help guys! I have a very high arch and training for my second 10km so am running about 3 times a week doing 4/5/6 kms.I currently weigh about 10 stone 7. I have had a pair of Pegasus 27’s and a pair of Pegasus 30’s and love them (though I think I liked the 27’s more?..) but I’m looking for a new pair as the 30’s are on their way out. Having looked at a load of your reviews I’m confused! Do I go for another pair of 30’s as you said the 31’s have less arch support? and you said don’t get the 32’s get the 31’s if you can? You also suggested the Vomeros which I’ve never tried on, would these be a better choice? I have tried on quite a few Asics for comparison and I felt like I was sat on top of them and me foot wasn’t enclosed which I really didn’t like! any suggestions would be GREATLY appreciated!! To make things simple, 1) Get the Pegasus 30 if you can 2) Get the Pegasus 31 if P-30 isn’t an option. From one of our other reader comments, it appears that the female version of the Vomero behaves differently in terms of it – tighter around the midfoot – so try them on as a back-up option and see how they feel. That should read “footstrike lens”? Thanks for the spot, fixed it! We know there are plenty of typos lurking in our reviews. Each review is proof-read at least a dozen times; yet mistakes slip through. Sigh. I miss/ overlook some info on your otherwise great reviews. First is basic facts about tester(s), like male/ female, weight, footstrike, experience etc. Second is toe-to-heel offset, or drop. Please correct if I am wrong? We omit personal information – and that is why the site also misses information on who we are, names/location etc. The reviews are male runner targeted, as the colors of shoes and sizing suggests. At this point, it is the best we can do, and we have good reasons of our own. Heel to toe drop is mentioned in the list of reviews, and in the top summary section before the review if the brand makes the information available. In this review, it is called out in the ‘tech’ section right at the top. I fully understand your wish to be anonymous. Still, you are leaving out an important part of your methodology when not giving up _any_ of test runners data. Weight, footstrike and number of testers would go a long way, and I can’t see how that would reveal anyones identity. You seem so thorough in every sense, but concealing tester data make me concerned about your actual agenda. Well, then see it this way – our reviews have their limitations. If you are concerned about our ‘agenda’ (have no idea what that means), you are welcome to take our site with a pinch of salt – and everyone should anyway. Solereview is just one of the many running shoe reviews out there. Hi solereview, your reviews are really helpful and in depth so thank you for that! My question is that i am stuck between a few shoes and cant decide. I heard Floyd Mayweather say the Mizuno Wave Prophecy 2 was the best running shoes he’s had. I will be using the shoes for long distance running at high speed plus agility training for boxing. Mr. Mayweather might have his own reasons for personal choice of shoe; you have to go with what feels best. For long distance pace workouts, we’d either pick the Glide 7 or the UA Gemini. The Prophecy has a very unique ride, so whether you like them or not depends on your preferences. Read our Prophecy 1 review (2012) for more – Prophecy 2 uses the same midsole. Thanks for the reply. So which shoe would you say is better between the UA Gemini and the Glide 7? Hi, if you can get the Pegasus 31 for cheap, then a better choice over 32. Please suggest me good shoe for very long distance running. I’m unable to decide which one should be better for me-nike Pegasus 32, mizuno Hitogami or adidas adios boost? Please consider that I have pain in my ankles and knees I am advised to wear shoes with better coushning . my friends suggest me Hitogami as they themselves use muzino for long distance running. Thanks in advance. Some people like their shoes to be spacious for long distance running, some prefer it the other way. Ultimately, you’re the best judge of what you want. If you have pain in your ankles/knees, then shoes only play a small part in relief. You should see a physiotherapist or equivalent medical professional who could recommend the necessary strengthening/conditioning regime. The Glide 7 Boost is a good shoe for long distance, has enough cushioning without being mushy/slow. Stunning reviews all over the site. I very much appreciate it – helps me out a lot. I would like your help since I am in a bit of a pickle. Short question is: Would I find my self at home in a pegasus 32? As a runner I tend to supinate (or underpronate, whatever you would call it) a little. Unfortunately this has contributed to a number of injuries, especially two serious ancle sprains in my left ancle and one stress fracture in my left fibula. Over a long period (5 years or so) I have run in two pairs of Saucony Mirage 1, one Mirage 2 and now I find myself in my first pair of Mirage 5. In between the two Mirage 1’s I ran in a Supernova Glide 4 (loved it, smashed the shoe), a Saucony Triumph 9 (did not like it, really annoyed my arch), a Glide 5 (same feeling as the Triumph 9) and a Adidas adistar Energy Boost (found them way too soft). I then went back to the Mirage 1, because it for some reason worked for me – the low weight, forefoot strike, ability to do longer runs – I have tried to search for shoes in this category. The Mirage 2 followed and was kind of meh (found it a bit stiff, but managed to wear it down). Now, I feel a kind of irritation in my arch when running in the Mirage 5, similar to what I’ve experienced before – but sometimes it’s not there. It tends to go away when I run intervals, but at a slow pace I can feel it. At the moment I primarily run short distances (less than 15 km) and some interval training, but I intend to ramp my interval training as an 800m-runner and I felt both the Mirage 1 and Glide 4 suited the different running distances. Seeing as I have tried some really different shoes in my opinion: Should I consider to revamp my running shoes setup, eg. having a lightweight shoe, maybe a asics DS racer or Saucony Kinvara (staying at the same brand, even though it is minimalistic shoe), and a Nike Pegasus 32 for longer distance? It’d have to comply with my supination ‘issue’ of course. As a slightly frustrated injury-hit runner, I hope for a little bit of help. Thanks again so much for your in-depth reviews having spent many hours trying to find a compatible shoe. Thank you for the comment! Glad to hear that you like our reviews. Stress fracture is a serious injury, what did the GP/Physio say was the cause? Usually stress fractures are caused by high impact workouts, and at times ultra minimal footwear can be a cause. If the root cause was indeed the supinating character of the heel (in your case, weight loading/transition instead of footstrike impact), then perhaps the Pegasus 32 isn’t the right shoe. It has a noticeable amount of lateral lean when compared to stabler shoes (no idea about the Mirage though, haven’t reviewed them), or in other words, lack of lateral support. And knowing that you did better with the Supernova Glide 4 (the one with the formation heel), which was definitely more supportive than the Pegasus 32 under the heel. Given the footwear history, shoes such as the adidas Glide 7 Boost, Nike Vomero 10 or the Under Armour Speedform Gemini might be better suited for the situation. All of these are suited for a forefoot strike with enough cushioning to go the distance. Not very heavy either. The key here, we think, is to stick to a shoe which is very neutral, meaning no lean or bias under the heel. This is regardless whether you’re going fast or easy. No guarantee our recs will work for you, but trying to help somehow. Would be hugely helpful to hear about your future experiences and understand what ultimately ends up working for you. Wow! Did not expect such an elaborated post. It’s extremely helpful for me. I will be picking up the Vomero 10 and LunarTempo having tried them on in-store. Will let you know how it all feels. You are very welcome. It would be great to have your feedback on the LT/V-10 here – it will be useful for other readers! Do you think that the Pegasus 33 will have a Lunarlon midsole? What do you think that would feel like, with just a zoom air unit in the heel? Have absolutely no clue about the 33. I tried these on the other day and they seem to fit decent, wondering if there are any other options you’d recommend. My problem is that i have a size 9 left foot and a size 8.5 foot on a brannock. Also, I have small toes in relation to my foot which makes trying to match where my metatarsus bone ends with the widest part of the shoe a challenge. I’ve been told you want to try and match that break point on your foot with the widest part for a more effective fit. I actually fit a size 10 in these. I currently wear a size 9.5 Adidas Boston Boost to train in and I really like them but i want something alittle more cushioned on 8+ mile runs. I also want something to assist me as I try to move from a more heel strike to a midfoot strike (if that’s even possible). I’m a neutral runner who weighs 150 with plantar fasciitus. I really like the boost foam compared to other foams but I’m willing to stray. I tried the Adidas boost ultras but the problem is I get heel slip on my right small foot cause they don’t have the extra shoelace holes near the heels to lock my heel in better. Again, due to the small toes, I have to almost size up a full size on my right foot because of my left which i’m a half size up. This makes fitting a shoe challenging. Oddly before the boost i ran in Mizuno wave riders and they felt responsive to me though a bit harsh. Having differently sized feet is perfectly normal, and a common occurence! Given your Boston Boost experience, have you tried the Supernova Glide 7 Boost? More cushioned than the Boston, though the heel grip isn’t the best – but really depends on how you fit into them. You could try the Pegasus 32 and the UnderArmour Speedform Gemini. Both shoes have a shallow toe box, which might be suited to your foot, and the heel lockdown is adequate. Do you think the “lateral lean” would present issues for underpronation/supination ? Can’t say for sure, depends from runner to runner. If you have faced discomfort with a shoe (featuring a similar design) before, then that aspect is relevant. I had a couple of Peg 28’s which were perfect for me. I found the Peg 29 too soft and squidgy and am looking to change. Based on your reviews and trying them on in the retailers, the Peg 31 seemed too hard for me. I assume the Peg 32 is similar based on your review. While these shoes do not feel the same as a Pegasus 28, you could try the Brooks Glycerin 13 and Saucony Ride 8 as options. Hi! I find your reviews very useful! This is a great site indeed. For almost 2 years I’ve been running with a pair of Pegasus 30, and I love them! As of today they got more than one thousand kilometers and I know it’s time to replace them. I’ve been thinking about getting a pair of Pegasus 32. Do you think they are as flexible and light as the Pegasus 30? I’ve found that flexibility is an issue for me because I had the chance to run a few days with a pair of Pegasus 31 last year and they chaffed my soles right next to my big toes on both feet. Bummer. If the Pegasus 32 aren’t the most recommended for me, which one’s would be? Last year I got a pair of Asics Nimbus 16 and even though I found them super comfy and flexible, they gave me pains and cramps on the insteps and pain from my heels to the calfs on every single run. I was so in pain that I had to take physiotherapy. I’m afraid of spending money on a running shoe that won’t fit me right. What do you say? Your help will be very much appreciated. By the way, I run +15 miles per week and I’ll be running my 5th half marathon very soon. Hi! The Pegasus 32 is firmer than the 31, and built on the same midsole design. So if the 31 does not suit you, then chances are the 32 won’t too. The only two shoes we can think of are the New Balance 1080 V5 and the Saucony Ride 8. What about the Vomero 10? Thank you very much! We would have ideally recommended the Vomero 10, but only for its forefoot, which runs slightly stiff (read less flexible) due to the Zoom Air Bag insert. Between the Pegasus 32 and Adidas Glide 7s, which fares better? Depends on what you’re looking for in a shoe. What aspects are important for you? Definitely the ride and the response on each step. Glide 7s have been a great ride with the boost material when I do runs about 5km, Though I’m disappointed that the shoe’s midfoot pressure, at times, become too tight, I am still able to enjoy a nice striking experience on the Boosts, averaging distances about 5km or so each run. We personally feel the Glide Boost to have a more balanced in its delivery of responsive cushioning. If you wait up for a month or so, the Glide 8 Boost should release soon. I too feel that I should wait for the arrival of the GB8s.. back here, Adidas just released, what I assume to be, the final few colours for the GB7s (Grey/Red and Red/White) and I’m hoping it will come soon. If not, I may just reconsider the GB7s again…Sole durability, not to mention, is excellent. Which begs the question, if you guys are able to give your opinion, I have so far been using US 9.5 for the Glide Boost 7s. When I bought another pair of Glide Boost 7s, they seem to create a slight heel sliding sensation when I wear it, even with tight lacing. I understand that new shoes have this sensation for a while, it did not seem to reduce its slides when I’ve worn it for a week and did runs up to 10km in total distances. When I went to a local running consulting shop and they took my measurements, they said that I actually fit US 8.5 – 9, but their range of shoes being sold does not include Adidas, but rather brands like Nike and Asics. I understand that Adidas sizes require half a size up from such brands, so in theory, a US 9.5 would fit but I really wonder why I had a heel sliding sensation on another pair of Glide Boost 7s. I tried on US 9 GB7s and I slightly found the front to be much smaller and squeezy as compared to the 9.5s, which provide great room for running. This has left me in great doubt over my actual fit size. Is the heel slide really noticeable? We mean, does your foot actually slide out of them slightly during running? Any blisters or chafing? The Glide Boost heel sidewalls are lower than other brands, so that might leave a different impression as regards the heel grip. And are you using heel lock lacing? It’s noticeable, but when tightened, it becomes slightly reduced. Thankfully, it doesn’t slide out fully of the shoe each step. No blisters or anything. I’ve tried the heel lock lacing too. adidas fit is generally a bit wonky compared to US brands, so if the shoe isn’t causing any issue and you don’t want to return it, then you’ll have to live with it. Thanks! You guys are a great help! Hey guys what do you think of the sneak peak photos of the Peg 33? Do you knowledgeable guys see any major changes? It looks pretty cool. Interesting. Can’t tell a lot from this picture, except that toe box looks higher, the outsole has these smaller ridges like the Pegasus 30 (better grip?) and the tongue has become like what’s used on the Elite 7. Looking at that peg 33 pic. It looks like the forefoot has 2 larger rubber bits instead of 4 that the peg 32 has. Wonder if that would make the shoe less flexible? Hard to say. Also depends on any other flex grooves between both ends, how soft the rubber/midsole is, etc etc. Yeah true, They look good anyway. Out of the peg 32 and vomero 10 which shoe is better if you need to stand around, be on your feet all day? On your feet all day? The Vomero 10. Yes ok thanks. Vomero is a softer shoe more comfortable I guess. Absolutely unbelievable review! Not only helpful but extremely educational for me. I loved the Pegasus 30 so much, I have 4 pairs. I was very disappointed by the change made with the 31. I’ve continued to buy 30s on ebay but probably need to move on at some point. I used to wear Mizuno’s wave rider for at least 4 generations until they changed the design with the 16. After that, the Brooks Ghost 6 worked for me, but I felt like the shoe didn’t last very long and held a lot of moisture. That’s when I found the Pegasus 30. I typically have a neautral step but at high speeds have a tendency to supinate. My arches are high but I switch out the insole for a soft insert made by my pediatrist. Any recommendations on a new shoe? Hmm… can’t think of a suitable Pegasus 30 replacement, but the Brooks Glycerin 13, New Balance 1080 V5 and the Nike Vomero 10 are options worth checking out. Hi, I’ve been wearing the nike pegasus 30 and 31 for over a year. I used to have very bad plantar fasciitis, but that has stop completely by wearing the pegasus. I am tempted to try the brooks launch 2. Is it similar in terms of ride to the 31? If not, which shoe has a similar ride to it. I tried the ghost 8, and was not a fan. No idea about the Brooks Launch 2. But if you were ok in the Pegasus 31, you will do fine in the Pegasus 32. Both the models share the same midsole. We suggest the Pegasus 31, though. It is still available in a lot of place online. I own the older Nike Air Pegasus+ 27 and have loved them! They are extremely comfortable! I still wear them but wanted to update my shoes. I really am not a huge runner but I do from time to time. I wear them for multipurpose activities (working out, jogging, playing drums, etc). Anyone have any idea of how they have changed in comparison with the 32’s? I also loved the way the 27’s looked. I haven’t seen the 32’s in person but online they look pretty good. I would like to find something as comfortable as the 27’s, and good looking, if possible. Thanks! To be honest, we only have a faint recollection of the Pegasus 25-28. From what we remember, it felt more cushioned/comfortable than the Pegasus 31 and 32. Instead of the Pegasus 32, we’d suggest the Vomero 10. I’m from Holland, so I hope you can understand my English. First things first, my feet are deformed due to Scleroderma. Most joints of my toes are fixed and some of them are arched. The sole of my feet are very thin, so I don’t have the cushening fat onder my feet. I virtually stand on the bones of my feet. Ten years ago I’ve discovered (dispite my foot problems) that it is possible for me to do some running. My podotherapist made me some great inlays. In combination with the Nike Pegasus shoes it was possible for me to return to the sport I’ve practiced before I got ill.
Running is very important to me. It stimulates my vasculair system (many capillairies in my hands and feet are chronic cramped so the bloodflow there is minimal). I’m a slow runner (10 a 11 km/h) and I find distance more important than speed. I’m 1m77cm tall, I weigh 61,5 kg and I’m 51 years old. Good running shoes for me are shoes with a lot of space in the toebox and a soft sole. My last two shoes were the Nike Pegasus 28 and the Nike Pegasus 30. Really great shoes! Last year I had a run with a distance of 25 km with the Pegasus 30! A few weeks ago I went to my favorite running shop to get new shoes, because the 30’s were getting old. I’ve tried the Pegasus 32, but they didn’t felt good. The sole was harder compared the 28 and the 30. I also found out that the toebox was smaller. – Nike Vomero 10: Not enough room for my toes. In my opinion the sole is harder than my old Pegasus 28 and 30. – New Balance 1080 V5: Pressuremarks at top of my arched toes. Sore calves after a 7 km run. In my opinion the sole is harder than my good ol’ Pegasus 28 and 30. – Asics Nimbus 17: Not enough room for my toes. Too bad, because I’ve read here that the sole is quite soft. – Nike Pegasus 31. Toebox was too small and I have my doubts about the softness of the sole. I did expect more cushening. – Last try: Brooks Glycerin 13. Enough room for my toes, because the toebox is very flexible (like the Pegasus 28 and 30), but the sole is harder compared to these shoes. Calves slightly sore after a 5 km run. Feels not good. The owner of the running shop told me that, if I don’t like Brooks Glycerin 13, that is the last shoe he can offer me that possible meets my needs. I really hope that you guys give me some tips! Thank you for the question. Do they sell widths in Holland? Because the Nimbus 17 is available in 2E and 4E widths, which will create a lot more room for your toes. I‘ve contacted the running shop regarding the available widths of the Nimbus 17. At the moment Asics cannot deliver shoes in other shoe-lasts. Stock = zero. I did some reseach about the Nimbus 17. I’ve read that some runners stated that durability is a bit poor, while this shoe is quite expensive. I’ve inspected my current running shoe, the Nike Pegasus 30. The information on the tongue says that this shoe has not a standard width. It says XE. I didn’t know that. I guess it explaines why my toes don’t fit in the above mentioned shoes. All the Nike shoes I’ve fitted had a D-last. The owner of the running shop had another tip. He will order for me a Hoka Conquest. This line of shoe has an extended width. I hope there wil be enough room for my toes. This shoe will work well for your weight – meaning you will experience its cushioning with no problems. 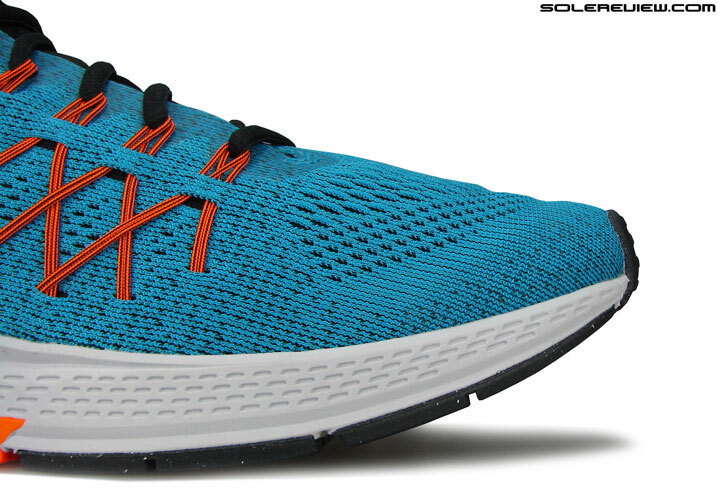 The XE on the Pegasus 30 is the name of the factory, and not the width. Nike does not print widths on its tongue. It is probably a D.
Good luck with the Conquest! Would love to hear how it goes for you. The runningshop did only have the Stinson 3 on the shelf. The toebox was wáy to small for my feet. In my opinion lesser toe space than the Pegasus 32 or the Vomero 10. It’s very hard to get Hoka shoes. When new shoes come available the running store will order the Conquest with a wide last for me. In the meantime the shoestore gave me the Saucony Triumph ISO 2. This shoe has a lot of toe space and a new cushening formula. I’ve tried this set on the treadmill (7,5 km run) and I did 8 km on the asphalt. The run on the treadmill went quite right. On the asphalt I had in the beginning stiff Achilles tendons. Lateron the run this sensation disappeared. Next day (no running) again this sensation. Can you tell me what’s the cause of that? Has it something to do with the toe to heel offset? The Triumph ISO 2 has an offset of 8 mm. 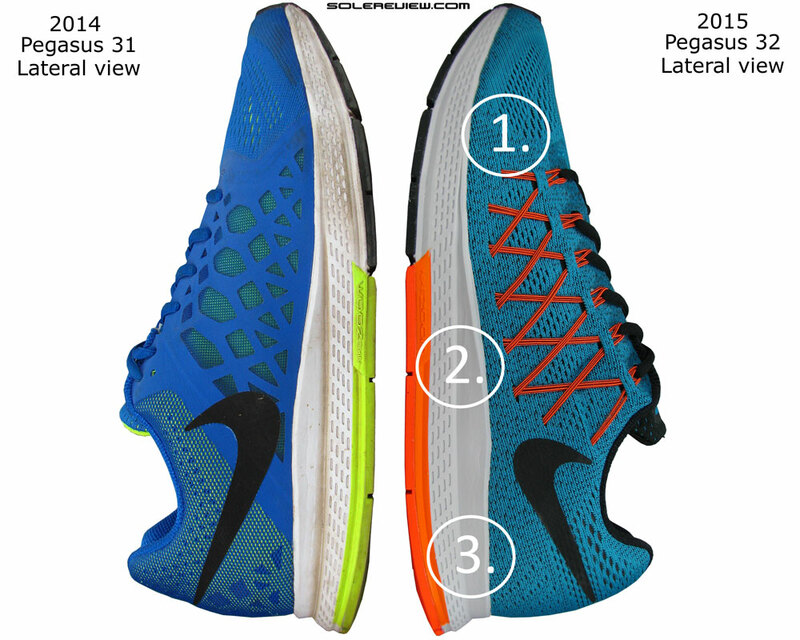 Do you know what the toe to heel offset is of the Pegasus 30? Were you able to try the Hoka Constant? That shoe has a lot of forefoot room. Not sure of the reason behind the Achilles softness; it is natural for the body to get used to new shoes. The Pegasus 30 should have an offset of 10mm or whereabouts, but is also softer than the ISO, hence it is possible that the effective drop could be lower than that of the ISO 2. Please take all heel to toe drop measurements with a grain of salt. The second asphalt run on the Triumph ISO 2 was even worse. In the meantime is this shoe reviewed at this site. I see that the cushening matches my experience. I’m quite sure that the achilles problem is caused by the firmness of the sole. I’m going to return these shoes. Again. 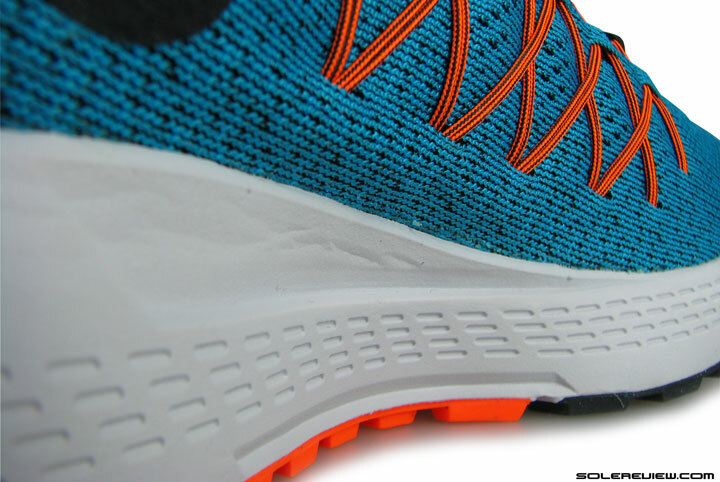 According to Solereview the cushening of the Hoka Constant is quite as much as the Pegasus 32. I had my doubts about the 32. It was stiffer than the Pegasus 30. I think that my orthopedic inlay influences the cushening of the shoe. The lower part of this inlay is quite stiff. I guess due to this inlay the landing force will be distributed over a larger surface. Larger surface = lesser cushening. Am I right? If this is right, the shoe must have more cushening to compensate this. This week I have a conversation with the store manager of the running shop. Maybe he has ideas. I still hate the fact that the Nimbus 17 is not available in a wide last. I’ve send a message to Asics regarding this. Maybe Hoka can deliver the Conquest in a wide last. We’ll see. That’s correct, an orthoses will vastly influence the cushioning and fit outcome. A larger surface might not translate into lesser cushioning – it ultimately depends on the material and midsole/outsole design. Also know that a ‘wide’ fit in 99% cases just means that there’s a wider upper, and not a wider midsole. Finally I think I’ve found the right shoes! I did three runs on the asphalt and it feels right. The sole is a bit less ‘cushening’ than the Pegasus 30, but even after 13 km there are no problems. No sore calves or stiff achilles tendons. I have plenty of toe room and the heel and midfoot fit like a glove. You’re right about a wide last. A ‘wide last’ suggests that the whole shoe is wider. That’s not correct. Only the forefoot has more room. When I compare the Vomero 10 with my old Pegasus 30, I see that both shoes have the same wide forefoot. I do now realise that my old Pegasus 30 is also a wide model. It’s confusing because Nike doesn’t print this information on the tongue. The store manager said that the Vomero 10 has the same 12 mm drop as the Pegasus 30. He’s right; that part feels the same as the Pegasus 30. The store manager also told me that he espects that the Pegasus line keeps the less cushened sole in the future. Reason: many Pegasus users grow in weight and Nike reacts to that to make the sole stiffer. I don’t know if that’s true, but that statement makes sense. I’m glad that finally I found a shoe that gives me a high percentage of the ‘Pegasus 28 and 30’ sensation. Great to hear that you’ve found a shoe you like, given the background. Thank you for sharing your story here! Hi Guys, just found your site, fantastic reviews! Could really do with some help on a pair of shoes. I changed a few years ago from road running to running solely up stadium steps for 30 minutes 3-4 times a week. All the load is forefront both up and down the steps so I want something which is really forefront cushioning extreme. I used Asics for years and NB a couple of times but finally got tired of the big toe hole/weak fabric issues and changed to Mizuno. However, this Nike Pegasus appears to have great reviews, great construction of the top of the shoe (so no holes look likely) and very good value which is important to me. Although I am unsure if you feel the frontal cushioning is enough? Would you have a few recommendations or suggestions for a neutral shoe that fits this HIIT type cardio with heavy frontal cushioning? I would go back to Asics if I have to but I’m considering a Saucony or another Mizuno, however considering the limited nature of my fitness training I am reluctant to pay their premiums at the top cushioning end products. I know the HOKA looks cushioned up to the hilt but I just couldn’t wear something that looks like a dinghy! Any suggestions with this dilemma would really help. Many thanks. Al, while the Pegasus 32 is a good shoe, you’ll more forefoot cushioning and responsiveness in models such as the Saucony Ride 8 or Nike Vomero 10. According to Competitor, the Pegasus 33 will have an updated midsole featuring Zoom Air units in both the forefoot and heel. Don’t you think that move will cannibalize sales of the Vomero? Because forefoot strikers will buy the cheaper Pegasus instead of the Vomero. That’s interesting having two zoom units if true. After wearing the Peg 31,32 they need more cushioning imo. Not my favourite Peg models. Talking to a rep in Australia he said that Pegasus sales have plummeted in the last 2 models because lack of cushioning. anyway here is another photo of Peg 33. I ran over 600 km’s in my Pegasus 32’s and I also felt the forefoot cushioning was too minimal- like a flat tyre. It could definitely use more spring at the toe-off. BTW, did you take the photo above? Interesting if this is true. Both can co-exist, provided Nike makes the Vomero 11 super plush. This has been done before, with earlier versions of the full heel to toe Air Pegasus selling alongside the Zoom Air based Vomero. Our point is: if you get the Pegasus 31 for a substantially cheaper price, get them over the 32. Not much of a difference between the two. We’d side with the Glides. That said, we don’t have any miles on the Supernova Glide 8 Boost yet. I’m a heel-striker who’d like to transition to a mid/fore-foot strike. So, I’m looking for a shoe that will make that easier for me. I was considering Nike Free 4.0, or something else from Free series. But I don’t want to go too low on cushioning considering the fact that I plan to use this shoe for let’s say half-marathon (or ever longer with time) length runs. What could you recomend ? Myself, I was thinking also about Flyknit Lunar 3 or some Pegasus. Should I maybe use something from Free Series to make transition easier and strengthen my legs and then buy something with more cushioning? I’m not an experienced runner as you can see so I’d really appreciate your expert help. We’ve replied to your other comment, asking about your motivations for transitioning to a mid-forefoot strike. Slight variation in the heel counter, but we did not think it significant enough to be called out in the review. I got the 32s thinking they would be the same as the 31s. Wrong. I have a wide foot and the 32 was just too narrow. I undid the laces to loosen the shoe, but still too tight. After a panic because I couldn’t find the 31s online (I’m in Aus) I went to the Nike factory shop. Success, and I bought two of the 31s (in the same colour). The guy at the check out counter was convinced the 31 and 32 were the same – but to me they fit differently. I even tried on a bigger size of the 32, but it was too big – to me it’s a narrower shoe. FYI I’m a female, US size 8.5. Yes, they fit narrower than the 31 for sure. Strange you couldn’t find a half size, though. Maybe because these are 31’s, the older model?